Yup, those look like dudes. 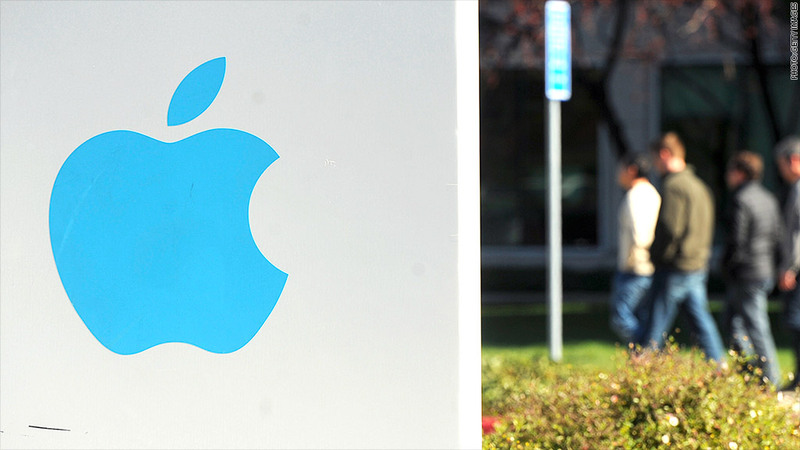 Apple became the latest tech company to reveal statistics on employee diversity Tuesday. The results? Predictably unimpressive. The company's 98,000 worldwide employees are 70% male, a figure that jumps to 72% for leadership roles and 80% for technical positions. "As CEO, I'm not satisfied with the numbers on this page," Apple chief Tim Cook said in an open letter accompanying the figures. "They're not new to us, and we've been working hard for quite some time to improve them." There's been a renewed focus on Silicon Valley diversity in recent months, with companies like Google (GOOG), Facebook (FB) and Twitter (TWTR) pulling back the veils on their workforce stats for the first time. Apple had not previously disclosed its employee diversity statistics. Apple's diversity figures are notable because Apple's employee count includes more than 41,000 Apple Store workers, most of whom earn an hourly wage. Apple's competitors, meanwhile, have a higher percentage of workers in technical positions. Apple's U.S. employees are 55% white, compared with 63% of the general population, though whites account for 64% of those in leadership roles. Asians make up 15% of the company, with Hispanics at 11% and blacks at 7%. The nation's overall population is about 63% white, 17% Hispanic, 13% African American and 5% Asian, according the Census Bureau, with women making up 49% of the work force. Cook noted that Apple (AAPL) has hired a handful of female executives of late, including new retail head Angela Ahrendts and environmental initiatives leader Lisa Jackson, and that it recently pledged $100 million to improve technology in underprivileged schools. Apple is also a sponsor of the Human Rights Campaign, a leading gay rights organization, and Cook personally has spoken out in favor of workplace protections for the LGBT community. "Inclusion and diversity have been a focus for me throughout my time at Apple, and they're among my top priorities as CEO," he said. Civil rights activist Jesse Jackson appeared at several annual meetings of tech companies this spring, including Google and Facebook, to urge them to do more to recruit African American and Hispanic workers. Google reported in May that its staff is 70% male. The search giant is 61% white, 30% Asian, 3% Hispanic and 2% black. Facebook said in June that it was 69% male globally, with its U.S. workforce 57% white, 34% Asian, 4% Hispanic and 2% black.